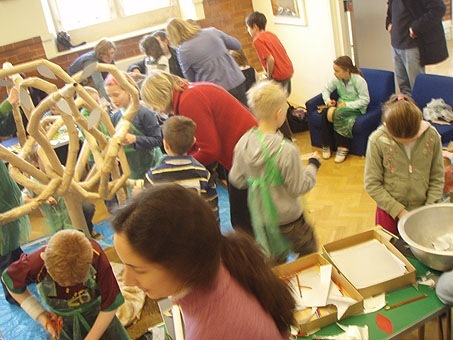 Mazy Bartlett , the school’s Outreach Artist, conducted a day of free art and making, in collaboration with Corsham’s Transition Community, in the hopes of raising awareness about green issues locally. 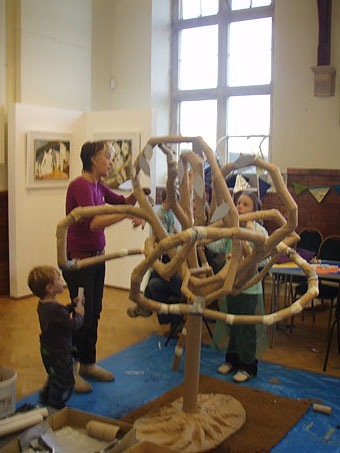 ‘There was a great turn-out, and it was really heart-warming to watch the way the children and adults co-operated with one another in making one fabulous toilet-roll tree. The skill and enthusiasm of the participants was very inspiring, and even the tiniest could contribute, with sticking on of brown paper, and making re-cycled bunting. We were very glad to hand the tree over at the end of the session to be made use of , as Nikki describes; and during the next Family sessions we will be elaborating on the theme, and sharing re-cycling ideas, so if you would be interested in coming along, just check the Pound programme, our school blog and newsletter, or posters around town.